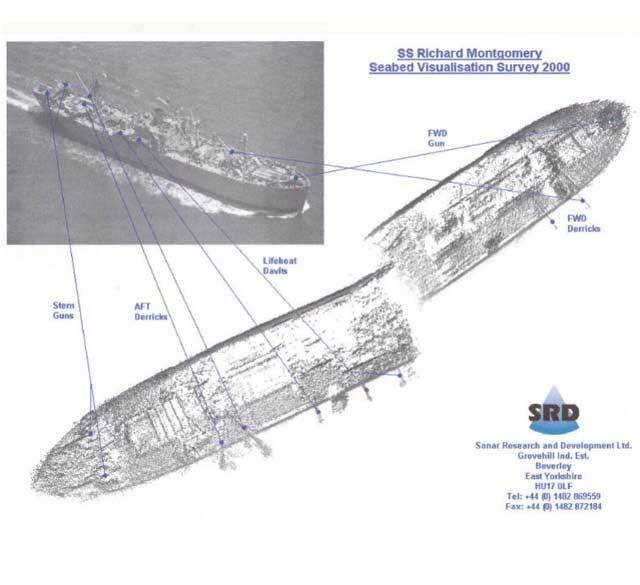 The SS Richard Montgomery is an American Liberty ship which ran aground and broke up during the Normandy invasion. It was loaded to the gunwales with explosives destined for a port in France, and had been waiting at the Royal Navy dockyards at Sheerness till it was her turn to go. While waiting, the ship ran aground and broke up in the heavy surf, spilling it's cargo. A civilian company was given the job of removing the 6,000 tons of munitions aboard the Richard Montgomery, and the operation lasted a month till the ship went to pieces and the cargo holds flooded. Much of the cargo is still in her to this day. The area is marked and monitored by radar, but the deadly cargo still sits at the bottom. It seems too much time has passed to safely get the cargo nuetralized and she sits there biding her time till what? It's possible that corrosion and the movement during tides or storms can set off what's left of the cargo. And it won't be some small explosion either. This was demonstrated by another ship that was in this same predicament, although it's end was catastrophic. The SS Kielce was originally The Edgar Wakerman, but was transferred to Poland during the war under the lend lease act, and after the war, was used by the US Transport Command to deliver supplies to US soldiers in Europe. It collided with another ship in 1946 and sank with an unknown quantity of munitions on board. It also sat on the bottom for years off Folkestone in the English Channel till a salvage company was recruited to clean the mess up. 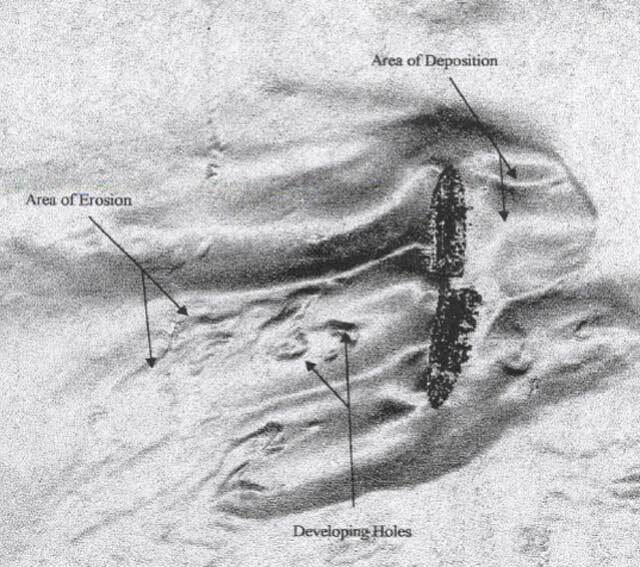 While detonating cutting charges to carve the boat open, the cargo unexpectedly went off, digging a 20 ft crater in the seabed, tearing up Folkstone (though maybe not as much as had been claimed from insurance companies) and being logged as a 4.5 seismic event up to 5000 miles away. So the Richard Montgomery waits there with her huge complement of mostly aerial bombs full of conventional TNT, silently brooding about her fate. A possiblitity of ships colliding with the wreck seem to be mitigated by the signs around the area, but a lost ship in the dark, who knows? 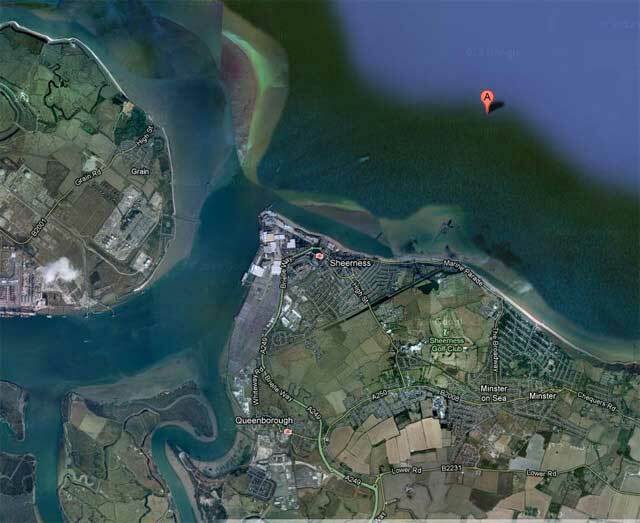 The ship site is being eroded by tides and waves, and the current position is to do nothing, and leave it's deadly cargo resting in the mouth of the Thames.